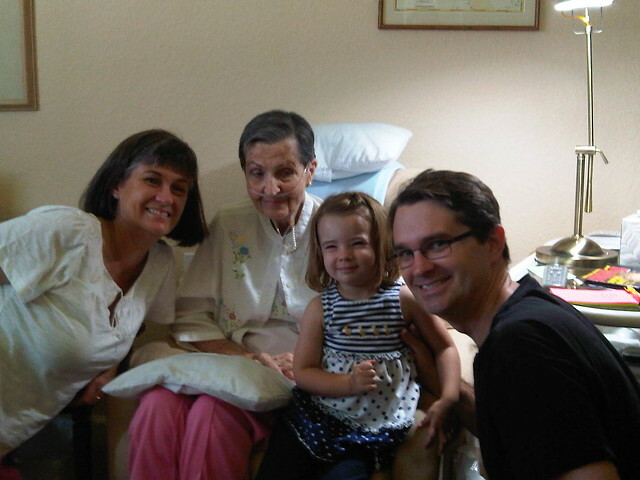 We’ll be flying back to the east coast tomorrow for my Grandmother’s memorial service. She died last year in Florida, but the family is scattered all over the country, so it took some time to get us all together. We’ll be meeting up in Connecticut. We describe her as “Grandma Margie” to Abigail, although I never called her this. She was just “grandma” to me, at least after I’d passed the early phase when I called her, “mum mum.” She started out life as Margaret Harvey, then later married my grandfather and became a McDonnell. She was a controversial figure in our family, but I’ve always had a positive relationship with my grandmother. I was the first grandchild, by quite a margin, so I think I got the best of her. I remember her for the lilting accent and the snickering laugh. I like to think my ability to take a conversation in my jaws and hold onto it with unrelenting determination comes from her. If you’d like to read more about her, she wrote a three volume autobiography. I flipped through it recently, looking for information about her experiences in the war. Her family lived in Portugal when the war broke out and returned to London in time for the Blitz. I’m sure the difficulty of those experiences, coming at such a formative time, helped shape the person she became. Her stories all seem to be held at an arm’s length, and you’re never sure how much is really a pure memory of the event. She lost her first child, my mother’s older sister, Christine, to meningitis when she was four years old. Maybe I’m placing myself in her position and thinking about my own kids, but when I read what she wrote about that day, I felt like the barriers came down, just a little. She’s not digging deep, writing only a page and a half about the events leading up to Christine’s death, but my grandmother comes through more. She was ecstatic to be a great grandmother, and apparently had photos of Abigail up all over her room. We took Abigail out to see her once, several years ago. No one thought to bring a camera, so all we have is a camera phone shot. It’s the last record I have, from the last time I went to visit her. Here it is, four generations together.